Mathew: Dug this. 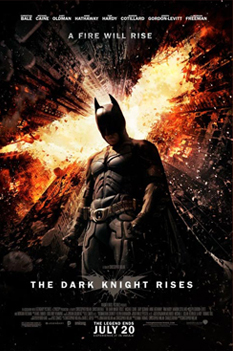 Not as good as The Dark Knight, but better than Batman Begins. Lot's of awesome action, cool effects, solid performances. All in all, a deft handling of the ending the trilogy. Mathew: Agreed? Really, just like that? Review over? Helm: What part of "yes" did you not understand? I also "dug" the film, though I agree with you that it is not as good as the second. The second was very tight and exceptionally well paced. This film was a bit flabbier and there were sections with far too much talking. Mathew: I'm flabbergasted! It's like we're totally on the same page! Helm: I also felt that the passage of time within the film was oddly handled. Several moments that should have taken very little time were played out too long and large stretches of time that should have been depicted in more depth were glossed over too quickly. Helm: Also, I felt that bodily injuries, including certain chiropractic events, were handled in a way that jeopardized my suspension of disbelief. Helm: -but most of all, I was very put out by the womanish weeping of a certain tough guy at a critical moment. Mathew: Oh yea-- Wait. What? Helm: The crying. I hate that particular variety of cinematic dung. Helm: NO! It was out of character. Miles out of character! Mathew: Helm! That's exactly why it was so powerful! It was pathos. Helm: It was wrong. Nothing but sentimental poppycock that made the character seem a nithing. Helm: Fine. You've asked for this. It was just that it suddenly dawned on me that you were not bothered by the crying because you yourself are such a cringing milksop. Helm: Do not deny it, woman. You could relate because you yourself burst into tears at the slightest provocation. Mathew: Sometimes crying is justified. Helm: Like when you run out of popcorn and the film still has over an hour left?